Water is essential to life. Without water, humans and our world would not survive. Yet, 11% of the world’s population – 783 million people – do not have access to safe water. Although many people living in the western world including myself often take water, sanitation and hygiene (collectively known as “WASH”) for granted, there are millions of people around the world who do not. The weight of water that women in Africa and Asia carry on their heads is commonly 40 pounds, the same as an airport luggage allowance. When I was in Ethiopia this past June, I witnessed firsthand the drastic unavailability of water and sanitation services. It could be seen every time I left the nation’s capital, Addis Ababa, and headed out along the roads leading to the rural population which make up 90% of Ethiopia’s 90 million people. Woman walking for hours with yellow jerricans on their backs. Mule carts loaded with empty and full jerricans. Even children carrying jerricans and walking miles in search of safe water. I knew little about Ethiopia’s water and sanitation challenges except the sites I viewed outside the window of a moving car. I have worked with WaterAid (one of the leading providers of water and sanitation around the world) before on various awareness campaigns and had even visited one of their sites in India yet I had little knowledge of the unique issues and challenges faced by Ethiopians. 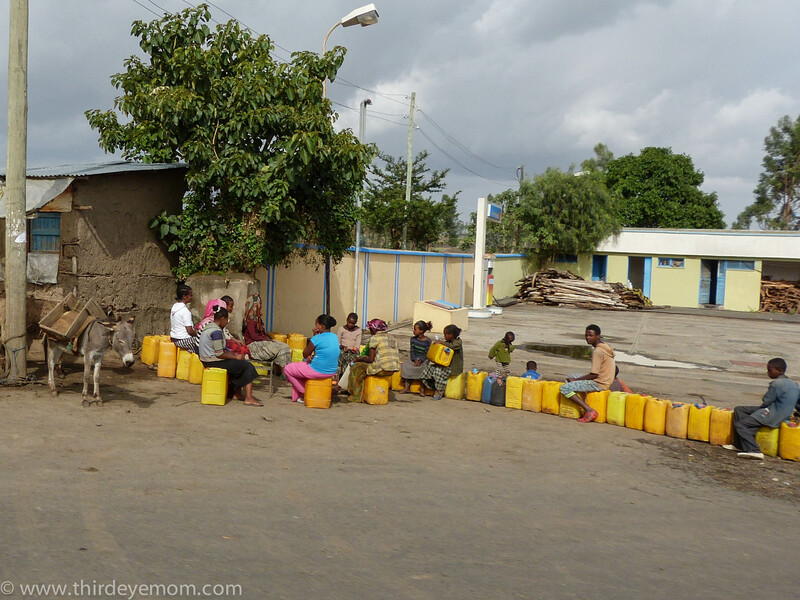 43.4 million people in Ethiopia do not have access to safe water. This is over half of the population. Over 67 million people don’t have access to adequate sanitation; almost four-fifths of the population. Around 33,00 children die every year in Ethiopia from diarrhea caused by unsafe water and poor sanitation. Life expectancy is a mere 56 years old. Boys getting clean water in rural Ethiopia. Surprised by the figures, I wanted to learn more and had the opportunity to speak with WaterAid USA’s new CEO Sarina Prabasi to gain an insight into the background of WaterAid’s work in Ethiopia and learn more about the challenges that remain in providing Ethiopia’s 90 million people with safe water, sanitation and hygiene. Sarina is originally from Nepal yet moved to the United States to go to college. She was inspired to work in the non-profit world thanks to her father who served with UNICEF for many years. Sarina grew up traveling the world and witnessing firsthand some of the challenges that people face. She has dedicated her life to serving others and making the world a better place. After serving seven and a half years in Ethiopia, in which five of those years were working as a Country Representative with WaterAid and most recently serving as Deputy Chief of Programs at Orbis International, Sarina took over the top position as CEO of WaterAid America and has become one of the world’s greatest advocates for increasing access to water and sanitation. Per Sarina, Ethiopia has made significant progress in terms of access to safe water and sanitation yet still has quite a way to go. Although Ethiopia is Africa’s second most populous country, it is one of the least well served countries in terms of water and sanitation. Many unique challenges have contributed to the problem including a long history of droughts, famines, conflicts and a low status of woman who often can spend up to 4-5 hours a day gathering the water for the household. Accessing water in Ethiopia remains varied and challenging especially for some of the most remote, hard to reach areas where infrastructure is poor. Yet organizations like WaterAid are working tirelessly with the government and communities to create partnerships that help build the country’s water and sanitation infrastructure. In fact, WaterAid is viewed as a pioneer in developing large community-managed water models that have proven quite successful. Sarina shared a touching story about a moment that truly inspired her work. She was visiting a remote village in Ethiopia where a child fell into a well and it collapsed on him. No child should have to die in such a preventable way. Sarina also said oftentimes mothers have to make very difficult choices regarding the rationing of their family’s water. Should she wash her child or keep the water for drinking? Should she give her thirsty child dirty, unsafe water or let him get dehydrated? No mother should have to make these kinds of decisions. Water and sanitation are a basic human right. Although significant progress has been made in Ethiopia, many challenges remain. The sheer size and scale of Ethiopia alone make the task of providing water and sanitation to all an enormous and complicated task. Furthermore, there are many different players in the field – national and local governments and different non-governmental organizations and partners – that must work together and take a look at the big picture. Not one plan fits all in Ethiopia. Finally, the gender dynamic must change and sadly this one will take some time. Women need to be valued and treated as equals. When you pass a woman carrying 40 pounds of water on her back and see her husband walking with a donkey carrying nothing, what does that say about women’s role and value? That a woman’s time and being is not worth much which is a hugely missed opportunity. A common sight in Ethiopia and many parts of the developing world: Yellow water jerricans. WHO/UNICEF Joint Monitoring Programme *(For latest updated stats on water and sanitation around the world). Ethiopia is Africa’s second most populous country yet is one of the least well served in terms of sanitation and water. Since 1983 we have reached more than 1.7 million and more than half a million with safe sanitation. I was in Ethiopia as a fellow on newborn health this past June with the International Reporting Project. I’m not completely sure I understand your comment. Are you saying that people in the developing world do not have the right to safe drinking water and sanitation? If they don’t have safe, clean water to drink such as in wells (which is what WaterAid provides and we in the Western world have), then they will die. Sanitation is the same thing since diarrhea is the second leading cause of death in children in the developing world. I guess I’m not understanding where you are going with this argument. California and Arizona are in severe droughts however people around the world have no water to drink without dying. How can this even be the same? Ethiopia has some arid parts but it is not a desert. In fact, it has a rainy season throughout most of the country and only a small sliver is dry like our deserts in Arizona and the American southwest. What the problem is, is that Ethiopia and many countries around the world are no where near as developed as the US, Canada, Europe and the rest of the “developed world”. They don’t have wells for safe water. It has nothing to do with the environment and watering plants. They have the water, but it is not clean. It is filled with sewage or unsafe, and causes people to die. In my opinion, everyone on this planet deserves clean water that you can drink so you can live. Our water uses in the US would blow people’s minds away. We use way more than most people and most people around the world don’t even have safe water or sanitation to survive. I believe every human being is valued the same. So in my opinion, every human deserves the right to safe drinking water and sanitation so they can survive. That is my opinion. I think that the developed world should be the ones to conserve on water. We are the biggest wasters and we had plenty to survive. Oh, I totally agree that every human being is valued the same and that developed countries take on more than their share of resources as a rule. I didn’t know that Ethiopia isn’t as arid as I imagined. I guess my interest is in the distinction of “right” and “responsibility”. I can easily say we need water and sanitation; I can’t so easily say we “deserve” it. That gets into areas of entitlement that cause other problems. I sit in Milwaukee and work in a museum that has an entire exhibit area dedicated to our remarkable sewage treatment system. On the Great Lakes, we sit on the largest collection of fresh water in the world. And we totally take it for granted and spend huge amounts of money and resources to process it. We have a responsibility here, I think, but we are not entitled to this water. You see the difference? Agreed! Just finished Jane Goodall’s book “Harvest for Hope” and the same discussion applies to Food as well. Multinational agribusiness corporations and the prolific use of pesticides, herbicides, antibiotics, GMOs and brutal animal farming methods are just some of the issues of responsibility that have had disastrous results. Local and sustainable practices are hard to implement in some places because it goes against the grain…even though it worked for centuries in bygone days. Change is reality, of course, and we have to keep doing our best to navigate the waters and keep in mind what is just and beneficial for the most living things. Life in Ethiopia is very difficult, especially for women. I spent one year of my life there and it was really changing experience. The Ethiopian state try to build more dams but this result in conflicts with Egypt because apparently the water of Nile River is not enough for the growing number of North African population. And the medical care is real nightmare. I don’t know if you had chance to visit a hospital but the situation is desperate. Wow, what were you doing in Ethiopia for a year? Yes, I actually visited quite a few hospitals and clinics of varying sizes. I found Black Lion Hospital in Addis to be horrifying. It is really terrible but at least the government and various NGO partners are trying to improve things and things are getting better but the baseline was so low it will take a long time. I just returned from California, visiting my son in Yosemite National Park. It is horribly dry. Three different fires started in Yosemite, Lake Tahoe, and Reno. The first two were started from natural causes, but the one in Reno was started by an arsonist. We do take our precious resource of water for granted in the U.S. and we do have a responsibility to preserve our natural resources. I foresee water wars in the near future…possibly all over the world. It really worries me, especially since I live in Nicaragua on the 11th largest lake in the world, where Lake Cocibolca is a water source for most of Central America….AND they are going to build a canal right through the lake. I’m not sure what we need to do to wake up our world and create an awareness of our need to protect and preserve our precious water sources. It is overwhelming to me. Thank goodness for people like you and your friend, Sarina, who can shout to the world! It appears to be working slowly in Ethiopia, but there is so much more that needs to be done. Wow, why are they building a canal through the lake? 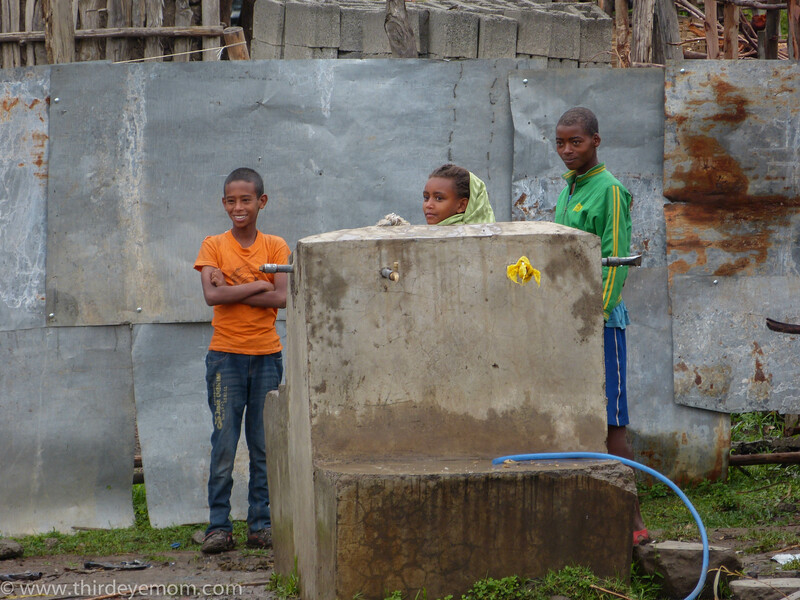 When my friend and fellow blogger Jennifer was in rural Nicaragua with WaterAid she said it was shocking how much they lacked water and sanitation. It was very hot too when she went. How developed is it where you live on your little island? Nicole, we have about 40,000 people living on our island. It’s a protected Biosphere Reserve. Demonstrations and protests are going on all over Nicaragua. This proposed canal is bad news. I just can’t imagine what the canal will do to our lake. The most vital and neccessery need for the survival of the life.The organizations aim is very interesting and should be sustainable. Yes indeed. Water is life.